You’ve probably heard that Archimedes had his “Eureka” moment when he stepped into his bathtub and realized that the water level rose. But did you know that our entire Universe, on the grandest scales, resembles the foam you play with when you are taking a bubble-bath? Apparently, bathrooms can be a scientifically inspiring place! As you may have learned from our last blog post, the Universe is filled with galaxies – huge collections of stars, some of them not unlike our own Milky Way. You can see these galaxies anywhere you look. Ok, that’s not entirely true – but you could, if you had really really really good eyes. When astronomers pointed the Hubble Space Telescope at a small, seemingly empty, dark patch of the sky, and exposed the picture for a very long time, they found almost ten thousand galaxies on an area a hundred times smaller than the full moon. If we scale that to the whole area of the sky, it turns out that the observable universe contains hundreds of billions of galaxies. There are as many galaxies as there are stars in the Milky Way! So, if a galaxy is made out of stars, are galaxies the building blocks of even larger structures? 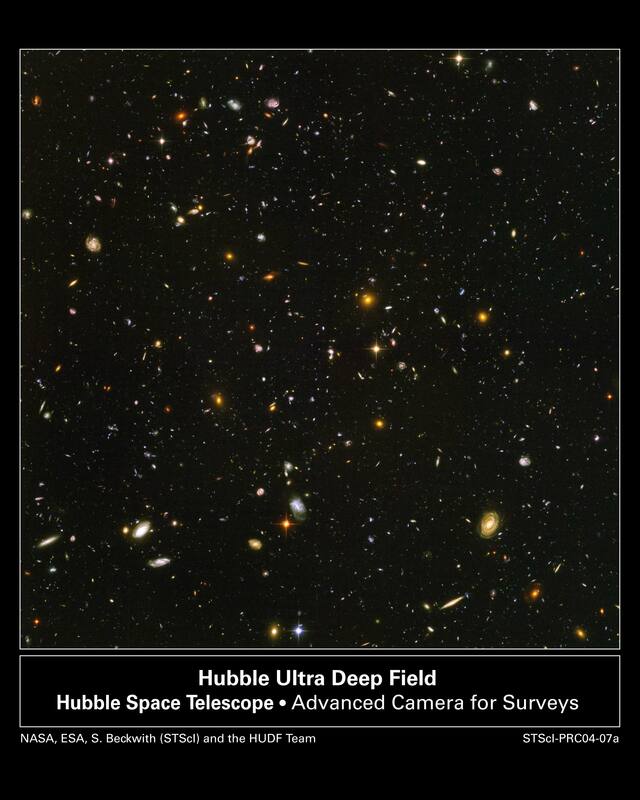 The Hubble Ultra Deep Field, showing many thousands of galaxies in an area a hundred times smaller than the full moon. Check out the full resolution version by clicking on the image and make sure you zoom in! In 1977, astronomers at the Harvard Smithsonian Center for Astrophysics decided to survey the positions and redshifts (distances) of several thousands of galaxies, in order to map their 3D positions. They discovered a fascinating structure: the Universe contains large regions that are empty – so called voids – surrounded by ‘walls’ of galaxies. You’ll need a bit of imagination here, because on the huge scales we’re describing, each galaxy looks so tiny it’s almost like a single dot. So, imagine the “voids” being the inside of the soap bubbles in your bath. If you sprinkled salt on the surface of each bubble, that’s more or less where the galaxies would be. Well, ok, sprinkling salt will probably pop the bubbles in the first place, so don’t try it at home, but that’s the general mental picture. 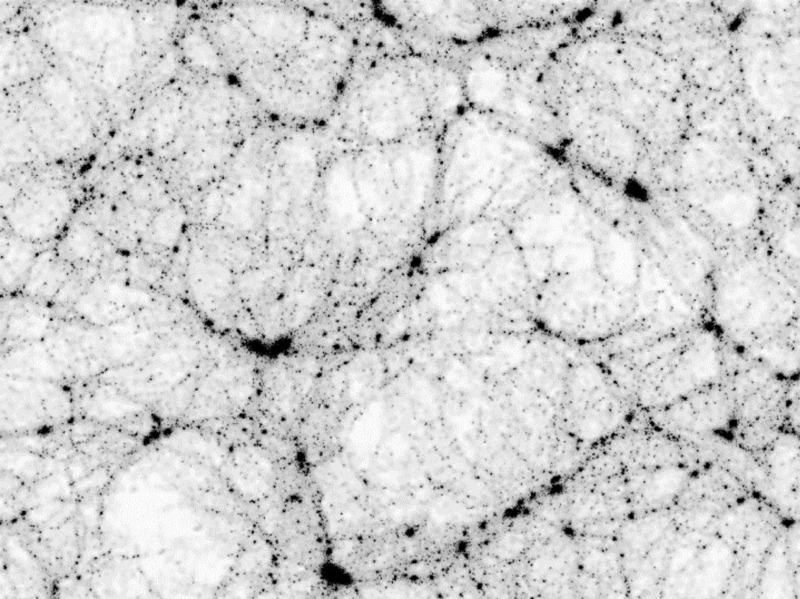 In this giant spiderweb of galaxies, our Milky Way is located in a thread (also called filament) connecting to a galaxy cluster in the Virgo constellation. Together with the Andromeda galaxy, M33, and a few tens of tiny dwarf galaxies, it forms a small knot, a local group of galaxies within this filament. It is fascinating to imagine that, if we lived inside a galaxy cluster, we could see hundreds of galaxies the size of Andromeda when we looked up to the sky at night. An astrophotographer’s paradise! Now, if you’ve watched the galaxy video above and had trouble “connecting the dots” and seeing the overarching large-scale cosmic web that is being traced by the galaxies, we have good news and bad news. The good news is that galaxies aren’t the full story: the space between closely packed galaxies (in galaxy clusters and filaments) is actually filled by a diffuse, very hot gas. So, the Universe connects the dots for you! The bad news though is that this gas only shines in X-rays, a very energetic form of light – and X-ray vision is pretty hard to come by. To begin with, our eyes cannot see X-ray light. And, although your doctor can use special detectors that are sensitive to X-ray light to look at your bones through a few tens of centimeters of your skin and flesh, X-rays cannot penetrate through the entire atmosphere, which is more than 10 km thick. So, the only choice left for astronomers like us, who want to study the Universe in X-ray light, is to use space telescopes orbiting above Earth’s atmosphere. The first satellite which detected X-rays coming from beyond the Solar system was called the Third Orbiting Solar Observatory, or OSO-3, and was launched in 1967. It was intended primarily to observe the Sun, but gave us some bonus extra-Solar discoveries as well (black holes also happen to shine in X-rays – more on that in Episode 8!). The first orbiting mission which was dedicated to celestial X-ray astronomy was Uhuru, launched in 1970, which proved (among many other interesting discoveries) that clusters of galaxies emitted X-rays. Several generations of X-ray satellites later, we now have quite a good understanding of what makes clusters shine in this kind of light – namely, the fact that they are filled with the extremely hot, diffuse gas we mentioned earlier. If you heat up a piece of iron, it will first glow red, and if you make it hotter and hotter, it will become yellow, and eventually bluish. That’s because the hotter something is, the more energetic is the light that it emits (and blue photons carry more energy than red photons). If you could heat something to a few million degrees, it will glow in X-rays – and that is exactly what happened to the gas in clusters of galaxies. How did this gas get heated to such extreme temperatures? Clusters of galaxies form by collisions of smaller groups of galaxies that are pulled together by gravity – and whenever two groups or clusters of galaxies collide, a huge amount of energy is released, which heats up the gas. In fact, collisions between clusters of galaxies are the most energetic events – the biggest Bangs – since the Big Bang itself, the birth of our Universe. Clusters also continuously grow as stuff (gas and galaxies) is falling into them from the filaments. This stuff comes in at pretty high speed, so that creates a few littler Bangs too, which help to further heat up the gas. The X-ray gas, beside being incredibly hot, is also incredibly rarefied. Even the places where this gas is at its densest contain on average only one atom for every 10 cubic centimeters of space. That is about 1000 times less dense than the best ultra-high vacuum obtained on Earth! But despite its really low density, this gas fills a gigantic volume – so if you calculate its mass and compare it to the mass of the galaxies themselves, you’ll notice that there is about 10 times more mass in the hot stuff than in all the stars in all the galaxies combined. Most of the atoms in the Universe shine in X-rays, not in optical light! At least, we think they do. The truth is that, while galaxies are relatively easy to spot, when it comes to X-rays, it’s pretty hard to see anything but the brightest parts of the cosmic web – the tips of the icebergs! We have little X-ray information about anything beyond the innermost 30% or so of the volume of any given cluster. And if most atoms shine in X-rays rather than optical light, that means we really don’t know much about the vast majority of the matter in the Universe. And that’s just what we set out to try to fix with our day-to-day research. In 2008, we published a scientific article where we chose a filament of the cosmic web that had a special geometry, which allowed us to look along the length of the filament – that way we could gather more X-ray photons than for any other geometry, so we were able to provide some of the best proof so far that filaments in the cosmic web actually shine in X-rays. Later, in a paper published in 2011, we used a Japanese satellite that is even more sensitive to very faint X-rays. This time, we did not reach all the way into the cosmic web filaments, but we managed to measure the properties of the X-ray emitting gas all the way out to the edge of the brightest galaxy cluster in the sky – this time, without the aid of a special geometry, so this can be done in principle for any cluster of galaxies in the future. We are in fact trying to extend this research project to several other clusters as we speak – that way, we can learn more about the 70% of the volume of each cluster that we could not study in detail until now. In 2013… well… we have some exciting new results about this published in Nature magazine – more on that here! This false-color X-ray image (in yellow and red) shows the hot gas in the galaxy clusters Abell 222 and 223, and in the cosmic-web filament connecting them (Werner et al. 2008). The X-ray emission is overlaid on the optical image of the same part of the sky. Tagged Chandra X-ray Observatory, clusters of galaxies, cosmic web, Hubble Ultra Deep Field, intracluster medium, shock physics, Sloan Digital Sky Survey, X-rays.